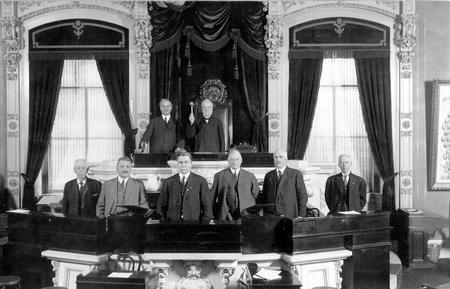 Difference between revisions of "Ohio Constitutional Convention of 1912"
| caption = Opening of the Fourth Ohio Constitutional Convention, Ohio Statehouse, Columbus, Ohio, January 9, 1912. #Cayton, Andrew. <em>Ohio: The History of a People</em>. Columbus: The Ohio State University Press, 2002. #Lamis, Alexander P., and Brian Usher, eds. <em>Ohio Politics</em>. Kent, OH: Kent State University Press, 2007. #Steinglass, Steven H., and Gino J. Scarselli. <em>The Ohio State Constitution: A Reference Guide</em>. N.p. : Praeger Publishers, 2004. #Warner, Hoyt Landon. <em>Progressivism in Ohio, 1897-1917</em>. Columbus, The Ohio State University Press, 1964.